Pinned Between Engine and Tender, Body Still Hangs. ON A, B. & A TRESTLE. Track Washed by Rains -- No Passengers Injured. Train Only Going Four Miles and Hour on Six-Mile Schedule When Trestle Gives Way -- Engineer T. T. Buckalew, Whose Home Was in Fitzgerald, Had Reputation for Caution. 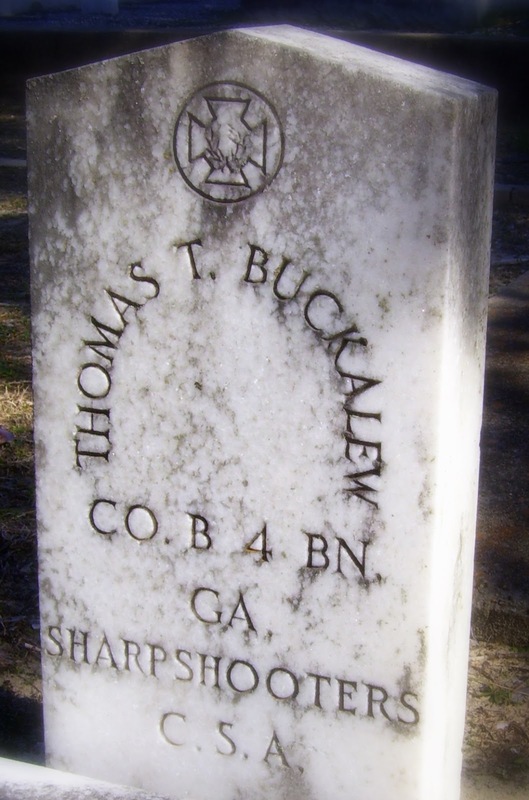 FITZGERALD, April 21 -- Engineer T. T. Buckalew was killed and his fireman, Henry Hardy, seriously injured this morning at 11:15 o'clock when the Atlanta, Birmingham and Atlantic passenger train, due here from Thomasville at 11:35 a.m., was wrecked on a narrow trestle eighteen miles from Fitzgerald. The wreck occurred near the Hanson station. The foundation of the trestle had been washed away by continuous rains. All the track collapsed as the engine rolled upon it. The faithful engineer's first thought was of his passengers, and the next instant after applying the emergency brake the engine went down, pinning the engineer's body between the tender and the engine. The baggage coach was also pulled into the washout, but the passenger cars remained undisturbed, none of the passengers being injured. News of the wreck was phoned here from Mystic, eight miles from the scene of the disaster, and a relief train was immediately sent out. The passengers were transferred to the relief train and brought to Fitzgerald, but it was impossible to extricate the body of the engineer from the debris. Only the lower limbs could be seen suspended between the engine and the tender and the supposition is that the upper part of the body is burned and scalded beyond recognition. Mr. Buckalew was 67 years of age and had been with the Atlanta, Birmingham and Atlantic for ten years. He was one of the most valued engineers in the employ of the road. He was very cautious, and at the time of the wreck that cost him his life was making only four miles and hour on a six-mile schedule. He was a highly esteemed resident of Fitzgerald and is survived by a widow and seven children. The debris will be cleared away and the engineer's body removed as soon as the wrecking crew arrives from Vienna." I indeed hope Some day we'll understand.